A leading education expert has suggested schools should have a dog – or another sort of pet – as a means of decreasing stress and improving well-being. Speaking at the University of Buckingham’s Ultimate Wellbeing in Education Conference, university vice chancellor Sir Anthony Seldon emphasized how a classroom pet can reduce anxiety among young people. Held at Westminster Abbey, this conference looked at the ways in which stresses and anxieties affecting young people can be effectively addressed. The conference touched on issues concerning social media and self-esteem, with teenagers feeling pressured by the impossibly ‘perfect lives’ they see online. Because children can relate to animals when they are hurt and anxious and sad in a way that they can’t always with human beings. It will be a powerfully cost-effective way of helping children feel more secure at schools. It’s very easy to do, it’s very cost-effective, the evidence is very clear that it works, and every single school – primary, secondary, special – should have dogs. It’s hard to think of an easier, quicker benefit. 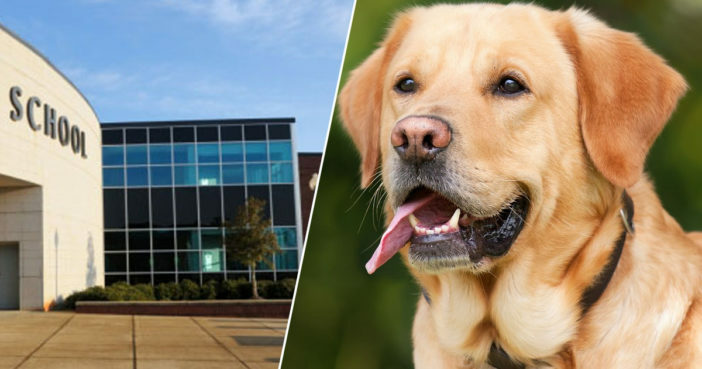 The UK has seen a growing number of ‘well-being dogs’ in schools, who bring a comforting and helpful presence to what can often be a highly pressurised environment. Noted benefits of a school well-being dog have included increased levels in concentration and a boost in overall happiness among pupils. Sir Anthony’s thoughts were echoed by education secretary Damian Hinds, who spoke of his own experiences of meeting well-being dogs during visits to schools. This is one of those things that wasn’t around when I was at school. I hadn’t really realised the incidence of it until I was education secretary. First I was a bit surprised, but actually it’s a great thing. For the kids, it can be really uplifting, particularly those that have different ways of expressing themselves and coming out of themselves, and the dog or the pets can really help. Although there are currently no plans to implement a ‘central dog policy’, it is still cheering to see this impaw-tant issue being given some serious thought. How much would you have loved a well-being dog to cuddle and be best buds with when you were at school?